Many of our user’s around the world will be celebrating Father’s Day this weekend. In commemoration, I’m going to show you a unique feature in RootsMagic that makes working with lines of fathers (and even sons) a snap. 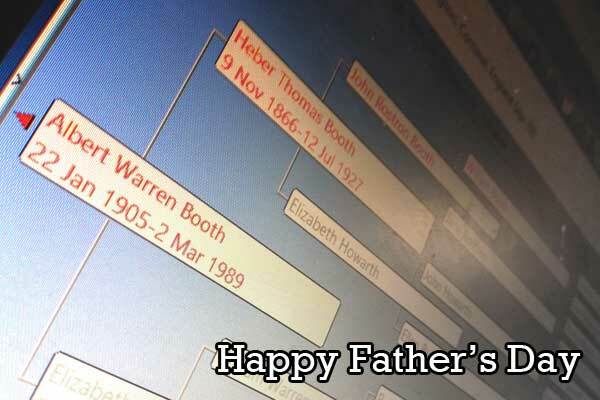 Isolating lines of fathers and sons can be useful in genetic genealogy when you need to find just those men in your file that should share the same Y-Chromosome. Others have used this feature for surname studies, tracking legal records, and more. The magic happens in the “Select People” screen. You’ll see this screen when you go to export a GEDCOM file, select people to color code, print a report for a group of people, publish a website online, and more. Any time you need to select a group of people to work with. Type the name (surname, given name) of the starting person of the line you wish to select. 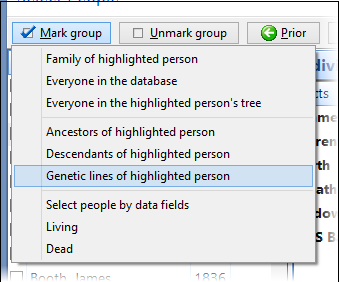 Once the person is selected, click on the Mark group button then select Genetic lines of highlighted person. Here you have several options. 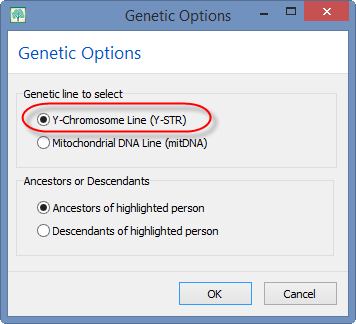 To select the line of fathers for the highlighted person, choose Y-Chromosome Line (Y-STR). 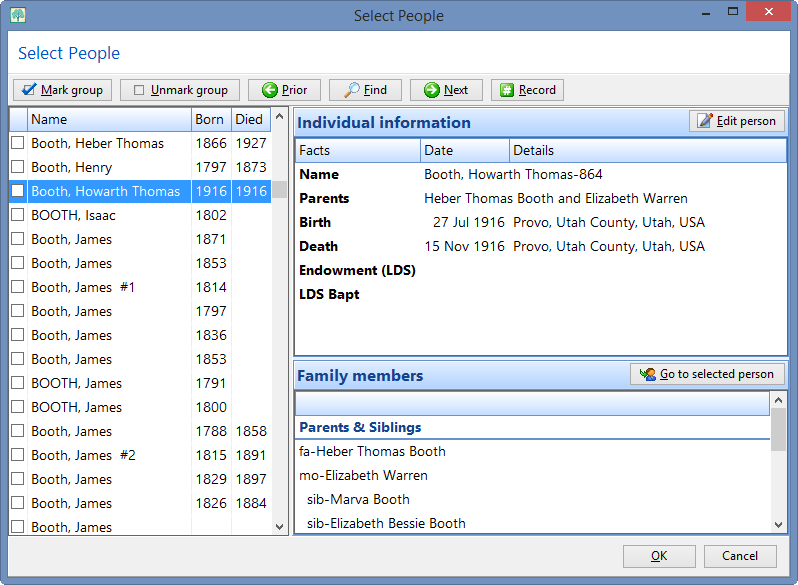 If you select Ancestors of highlighted person, you’ll follow the line of fathers up the tree. If you select Descendants of highlighted person, you’ll follow the line of sons down the tree. Click OK twice to complete the selection. Ta-da! You’ve now isolated a line of fathers and sons! Happy Father’s Day to all those important men in our lives. P.S. – We don’t want mothers to feel left out of the excitement. Astute readers will have noticed the option to select a genetic line based on Mitochondrial DNA Line (mitDNA). Since Mitocondrial DNA is passed directly from mother to child so this option will similarly allow you to isolate a line of mothers and daughters. mitDNA is really cool to track the feminine line.We are evolving into equality finally and it is taking genetics to do it. I like the steps given and being able to find who is a relative of a close relative. Here today I am teaching Roots Magic. What a fun tip to show. Thank you. I will be trying this out when I get home tonight. I am excited to try this! I copied the directions so when my time allows I shall do that. Great and we appreciate you passing it along. I have my tree and my husbands tree separate and don’t have a problem with the two sides. I prefer to use color coding for the direct lines (my tree goes WAY back). Recently found that I can color code all of the cousins one color and the direct lines another at the same time. We don’t have enough darker colors to color each individual line a different color. I also wish we could have more darker colors.